I am incredibly excited to be returning to CONTEXT Miami with Spoke Art Gallery this year for Art Week! Spoke Art will be bringing phenomenal new and recent works by Scott Scheidly, Dan Lam, Chuck Sperry and Scott Listfield. Visit us at Booth C102 this week in Miami or if you can’t make it in person – check out the online preview here! More info about the fair here. To inquire about available works or complimentary tickets, please email us at info@spoke-art.com. I am also excited to release my brand new piece – The Seer on Saturday, December 8th starting at noon! I will also be signing copies of my new book Chthoneon, and Spoke Art will have a limited number of The Oracle wood panel pieces available at that time. Additionally, Spoke Art will have a few archive panels available starting Tuesday evening during the Platinum and VIP openings. There will be no pre-sales or shipping from the fair for Chuck Sperry’s panels or prints. Any remaining new works will be available online following the fair. Each buyer will be limited to one “The Oracle” panel, one archive panel, one regular paper edition of “The Seer” and one variant paper edition of “The Seer”. Miami Art Basel Countdown! I’m excited to exhibit a featured installation at Spoke Art Gallery, and can not wait to see you all in art mecca Miami! Swing by Context Art Miami and visit Spoke Art booth #C102. And make sure to visit sister gallery Hashimoto Contemporary at booth #C115! For this year’s Art Basel week, Spoke Art will be exhibiting new and recent works by Dan Lam, Scott Scheidly, Chuck Sperry, and Scott Listfield. On Saturday December 8, a print release and a book signing with your’s truly! I’ll be there! I’ll be revealing my new print, new panel and surprises soon! Stay tuned! CONTEXT is located at One Herald Plaza in Downtown Miami. I will be making a very limited release of “The Ostracon” and it’s variants, my fourth and final Jerry Garcia portrait, with a very special book signing of “Helikon” – Thursday, December 7, 2017 at 2 pm – through Spoke Art Gallery at Context Art Fair during Art Basel Miami. Please visit us at Spoke Art Booth C133! Ostrakon. (in ancient Greece) a potsherd, especially one used as a ballot on which the name of a person voted to be ostracized was inscribed. While working on my book “Helikon” my work has been driven and inspired by the spirit of the ancient Greek muses and Greek mythology; Greek myths fill my art and my printmaking with theme and motif. My creative roots are in the San Francisco poster movement which began in the utopian spirit of social experimentation in the Haight-Ashbury, where I live today. I look sometimes at my early rock poster work through be-mused glass; music was viewed as “therapy” by the Greeks. Confirmation that the ancients were well-attuned. Anyone who knows the rock concert experience as I do, knows rock fans feel this way still today. Art for music concerts is a popular business, something with which the fine art world may be uncomfortable. In a democracy full of popular businesses, Art recently realizes it is also one. I hope my art serves as a democratizing influence in the sphere of fine art and in the culture at large. I made another poster which became emblematic of the March for Science of April 22, 2017. I was pleased to see that my March for Science posters reached the lectern of the demonstration where keynote speaker Bill Nye posed with NASA astronaut Leland Melvin alongside my poster image. My Women’s March poster and my Occupy poster were recognized by inclusion in the United States Library of Congress and in exhibition at the San Francisco Museum of Modern Art. It’s sincerely gratifying to receive institutional recognition, but the pressing point is to open minds and to inspire participation in our democratic society. Long ago as a teen I was packed off to college with Will and Ariel Durant’s eleven volume “Story of Civilization” by my enlightened parents who felt these books a necessary provision for well-rounded citizenship. I am always most drawn to volume 2, “The Life of Greece.” I re-read this book constantly. The Will Durant passage above — which describes the ancient Greek institution of democratic ostracism — was part of my inspiration for my newest art print “The Ostracon.” His words describing ancient greek polity spark thoughts of a vibrant, if messy and flawed, democracy. Today’s news is filled with a similar vibrance and messiness: impeachment, investigations, and a series of scandalous banishments. American democracy has been going through unimaginable upheavals in the last year; ostracism is in the air. “The United States has borrowed lots from the ancient Greeks, including such bedrock items as architecture, the Olympics, coinage, theater, and, most important, the concept of democracy. Visitors to Athens can still view the official drinking cups and tableware used in the 5th century BC, when legislators were wined and dined at state expense. Not much, in fact, has changed since antiquity except the technology. 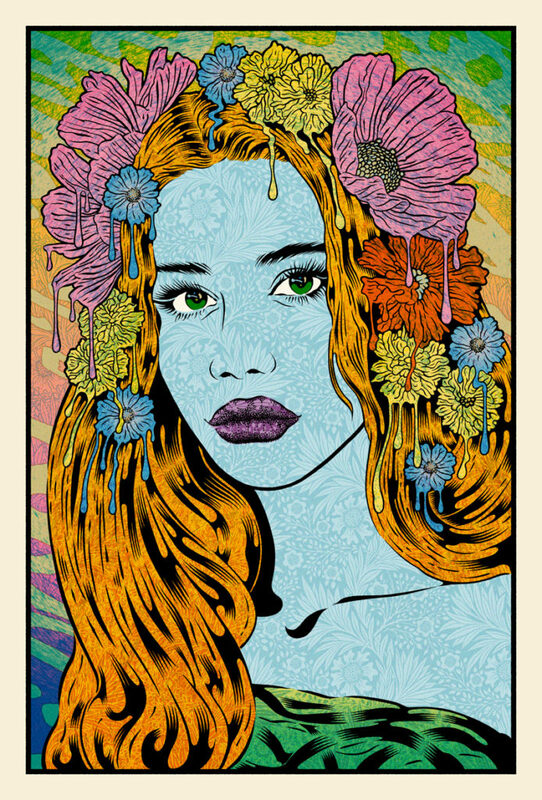 Introducing “Built To Last”, the fourth and final print in our portrait series with acclaimed artist Chuck Sperry. A limited edition run of 500 prints will be released at GarciaFamilyProvisions.com between 2pm EST and 5pm EST on Tuesday, November 21st. As with prior releases, prints will be restricted to 1 print per fan/household. Subscribe to the Jerry Garcia Newsletter at JerryGarcia.com to be among the first to receive notice when the prints are released. The Fourth and final in a series of four screen-prints from renowned artist Chuck Sperry celebrating Jerry’s life and legacy. Each print is signed & numbered by the artist in an edition of 500. I will be making a very limited release of my fourth and final Jerry Garcia portrait, a very special book signing of “Helikon”, and multiple print and wood panel releases – Thursday, December 7, 2017 at 2 pm – through Spoke Art Gallery at Context Art Fair during Art Basel Miami. As an added bonus, the Dead & Co will be performing in the Miami area the next night (Friday), so twice as many reasons to come join us in Miami for a fun art-filled weekend!